We are a leading Manufacturer of rumi boost powder, lactiup forte powder, animal feed supplement, aqua feed supplement, latciup supplement powder and lactiup powder from Chennai, India. 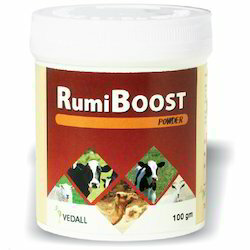 We are offering Rumi Boost Powder that is a supplementary protein mix that is widely used for lactating cows and cattle. Cows fed on grain rich diets or cows fed on extensive pasture-based farms are made healthy by the offered range, which also improves health and intestinal protein provision. Our supervisors make sure to carry out a strict quality check so as to ensure the performance of the product. The price range is affordable. Vitamin A	 7, 50,000 I.U. 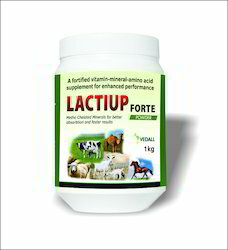 Being a reliable firm, we are offering Lactiup Forte Powder to our clients. 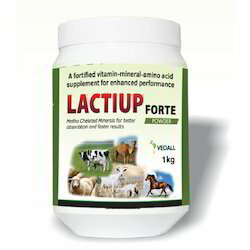 This high quality milk protein concentrate is much appreciated by the clients as the powder helps increase in muscle mass, lactiup forte powder is suitable for proper fetal growth in cattle, camel and horses due to enhanced resistance to stress, resulting because of environment change. Also, we have a team of dedicated professionals who work hard to manufacture the product. Owing to the enormous practice, we are capable to offer Animal Feed Supplement to our customers. These products are known in the market for their qualities such as precise composition, longer shelf life, and low prices. In order to keep pace with never ending demands of the customers, our company is instrumental in offering Aqua Feed Supplement. Being a reputed name of this domain, we are manufacturing, retailing and exporting supreme qualityLatciup Supplement Powder. Offered range of feed additives is processed using best quality ingredients in accurate composition. 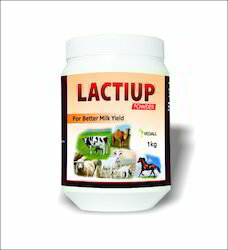 Spotted as a leading firm, we are offering Lactiup Powder to our clients. The powder is widely used to improve nitrogen metabolism for production and growth in cattle, camel and horse. 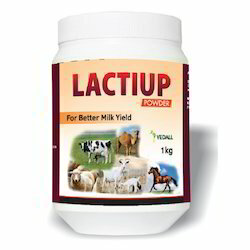 While mixing with cattle feed or water, lactiup powder uniformly distributes itself and gets absorbed, thereby stabilizing the microbial ecosystem and pH. Also our quality experts make sure to carry out strict quality check in order to meet the expectations of our clients. To stabilize microbial ecosystem and pH. We offer Goat feed Supplement options that contain the highest-quality ingredients, helping you provide the very best nutrition.